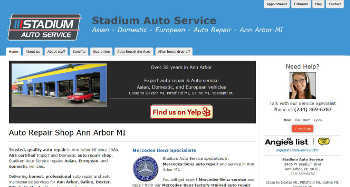 Submitting your auto repair website to online directories is a very different process than submitting to search engines. A successful Directory submission involves much more than simply providing your website name and URL address. Carefully crafting your directory submission can have big payoff for your auto repair website SEO ranking. Getting your website into high quality directories has big search ranking benefits. But extreme care is needed in making a submission. All quality directories charge a submission fee. With some it is a yearly fee. If the directory submission is not done correctly it could be rejected with no refund of the submission fee. Also, the way your submission is written can greatly influence your website’s ultimate ranking in the Directory and the ranking in any search engine that uses the directory's data. Important: Payment of a directory's submission fee does not guarantee inclusion in the directory, category selection, or website description. The Directory submission fee only guarantees that they will respond to your submission within certain time period by either adding or denying the website listing. Crafting a quality submission ensures the highest possible success in getting a directory listing. Robert Maxim ensures you of the best possible directory submission. The major reason Directories charge submission fees is that each submission is reviewed by a person. The main goal of these Directory editors is to ensure submissions are relevant, interesting and accurate. It is vitally important to highlight your website’s benefits and unique content - make it stand out from other websites in the same category. There needs to be an incentive for the editor to include it in the directory. Robert Maxim's directory submission service ensures you get the highest chance of submission success and top website ranking from your directory listing. Preparing for a directory submission starts with researching the various directory topic categories to find the most appropriate category to submit your website to. Then we must collect detailed information about your website contents and your company. We research your main keyword phrase and view the various related Directory categories. We study the websites listed within these categories and choose the most relevant category related to your website content. Often we will search for websites belonging to your direct competitors. The category they are listed in is likely the most relevant to your website. Finally, we also study the specific category description before submitting to ensure we have chosen the most relevant topic for your website. We use a slightly different description for each Directory submission to gauge which descriptions are more effective in encouraging people to click through to your website and which directories are providing the most website traffic. Directories provide their information to search engines and other directories so by using unique descriptions we can see which Directory submission is providing maximum auto repair SEO value. The secret to obtaining successful directory submission is to choose the most appropriate category and include a carefully written description that contains your main keyword phrase. It is rare that a directory editor would take the time to edit the submission or doubtful their edited description would be something you would be happy with. Usually they just reject poor quality submissions and tell you to try again. The fastest route to a assured directory listing is a quality submission! With Yahoo!’s large market share and popularity, I believe it is vital that your website be listed in the Yahoo! Directory. Yahoo! has a fee based expedited service for commercial websites submitted to their directory. A Yahoo! editorial staff member will inspect your website, consider your submission and respond within 7 business days. There are many "paid" directories your website can be submitted to but they should all be secondary to the Yahoo! Directory. We can suggest other directories once your Yahoo! submission has been completed. Generally the "free" directories have little value and are not worth the effort. The only exception is the DMOZ directory. It has high value for SEO but is totally volunteer operated and has very long wait times for submission review (that's what you get for "free"). Making a quality submission to DMOZ will definitely increase the speed your website gets listed. The Directory submission process can be time consuming and expensive but with careful submissions these highly valuable backlinks can pay big dividends for your auto repair website SEO for years to come. Robert Maxim's auto repair website directory submission service ensures you of the best possible directory submission to the directories with the highest auto repair SEO value.